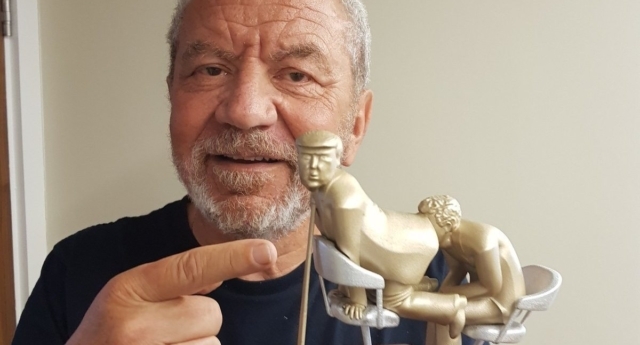 Lord Alan Sugar has shown off a paperweight of Piers Morgan in a compromising position with Donald Trump. Piers Morgan, a personal friend of Donald Trump, was widely mocked last month over an interview with the leader in which he repeatedly lavished praise on Trump while failing to significantly challenge any of the administration’s policies. But apparently Apprentice boss Lord Sugar doesn’t think so. The businessman and BBC TV personality took to Twitter to reveal he now has a paperweight of the cartoon. Some on the platform accused Sugar of perpetuating homophobic tropes by latching onto the joke. Mash Report host Nish Kumar previously responded to Morgan’s outrage about the cartoon, calling his homophobia allegations “weirdly patronising”.